There’s no doubt that Mildred’s Temple Kitchen (@mildredstemple) serves up some of the best pancakes in the city, but what you might not know is that they have a fantastic dinner service too. 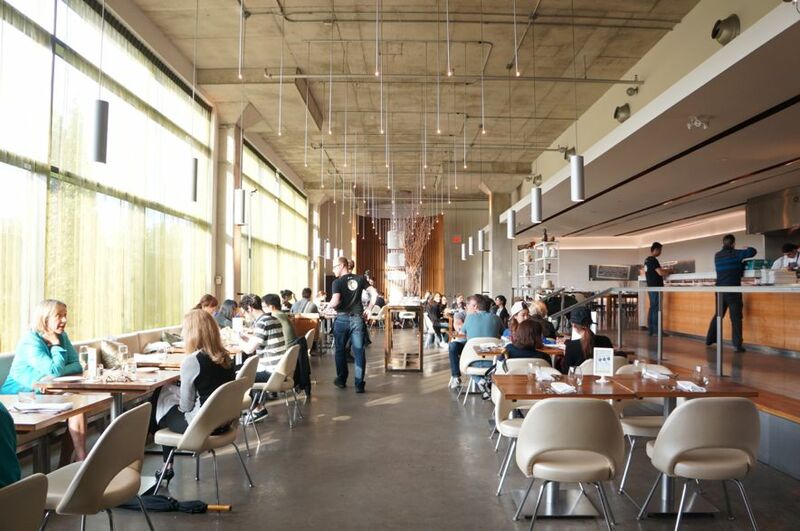 Located in the heart of Liberty Village, Chef Michael Leary (@chefmdleary) has been busy cooking up a storm in the kitchen. He’s created a new dinner menu broken down into several sections: “vegetable kingdom”, “water” (aka seafood), “land” (aka meat) and sweet treats. You can also opt for the feast for 2 for $65 which is basically a tasting of several items on their current menu. 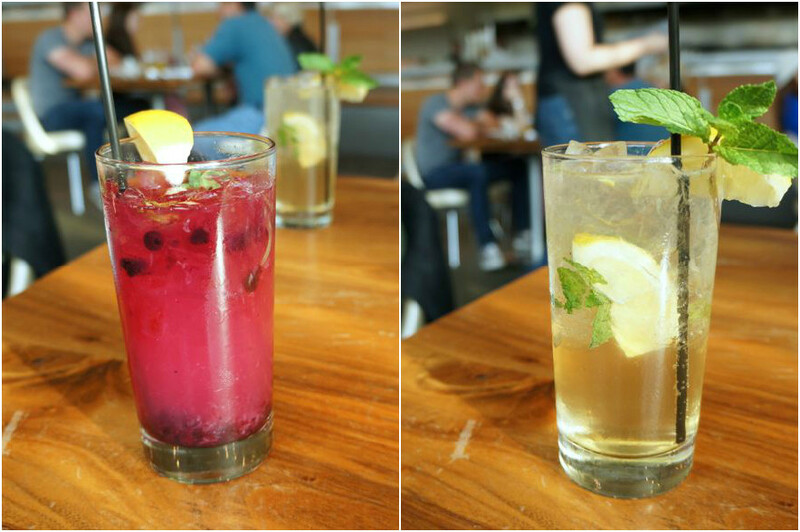 Blue Sky Lemonade – 1 oz Bombay Sapphire gin, fresh lemonade, basil & blueberries ($7.50) and GINger Fizz – 1oz Bombay Sapphire gin, ginger beer, mint & lemon ($8.95). They were both perfect drinks for the summer – very light and refreshing! 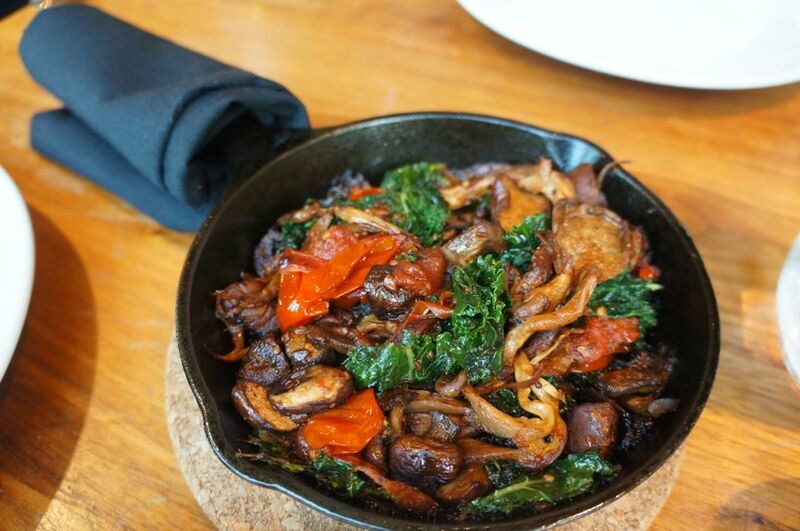 Mushroom Skillet – roasted King Oyster & cremini mushrooms, blistered grape tomatoes & kale tossed with black garlic vinaigrette, finished table side with pecorino ($14). Shortly after being seated, we saw this being served to the table next to us. It smelled so amazing that we had to get an order for ourselves and it didn’t let us down. I loved the mixture of the meaty and earthy mushrooms mixed with the black garlic vinaigrette. A mushroom lover’s dream! 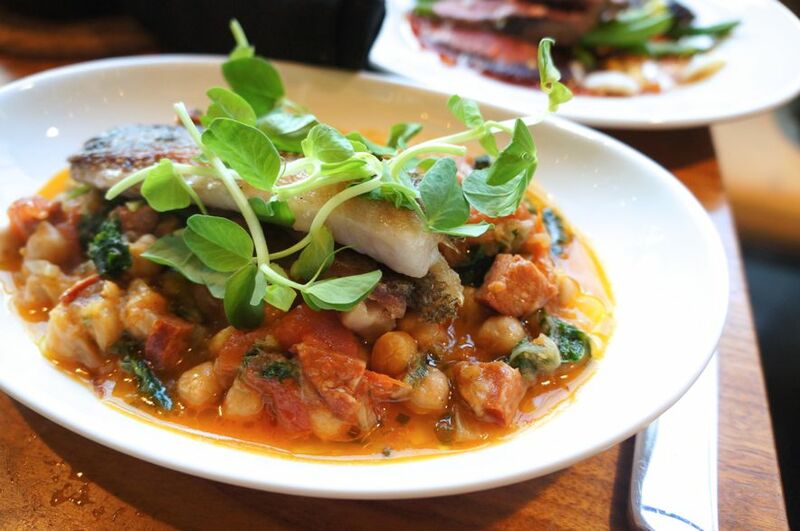 Lake Eerie Silver Bass – with a ragout of roasted tomato, garlic, kale, chorizo, lemon & olive oil ($16). I’m a big meat eater so as you can imagine, my eyes were drawn to the “land” section of the menu. The silver bass was Mike’s pick and boy did he pick right! It turned out to be my favourite dish of the evening. The skin was perfectly crisp and the meat of the fish was delicate and moist. I loved the accompanying ragout which consisted of chunk tomatoes, leafy kale and bits of spicy chorizo. Delish! 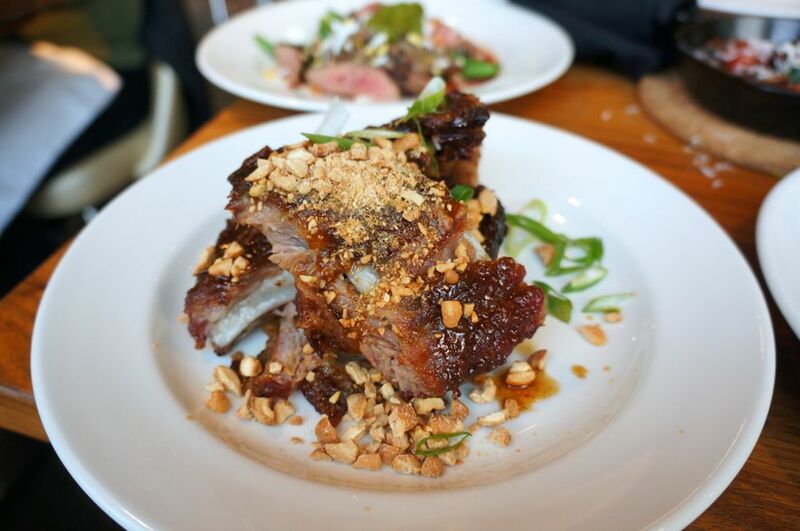 Maple Spice Baby Back Ribs – smoked roasted with Lanark county maple syrup & rhubarb BBQ sauce, topped with salted cashews & scallions ($15). The ribs were sweet, sticky and finger-lickin’ good. The generous sprinkling of cashew bits gave it a nice crunch and the ribs had a nice meat-to-fat ratio. Really tasty! 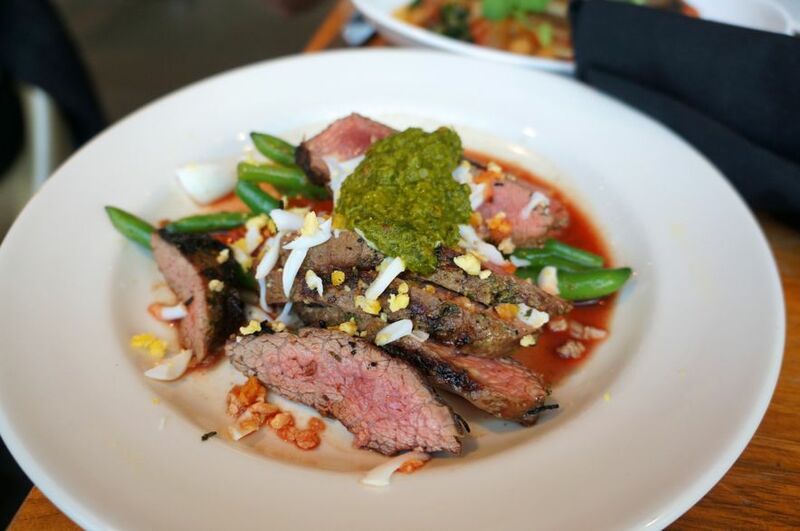 Chimichurri Steak – grilled 6oz flat iron with sautéed green beans, blistered grape tomatoes, tomato jam & grated egg ($16). The steak comes pre-sliced and had a whole lotta stuff going on with all the sides and sauces. The meat was cooked to a nice medium rare and the combination of the chimichurri and tomato jam worked really well. 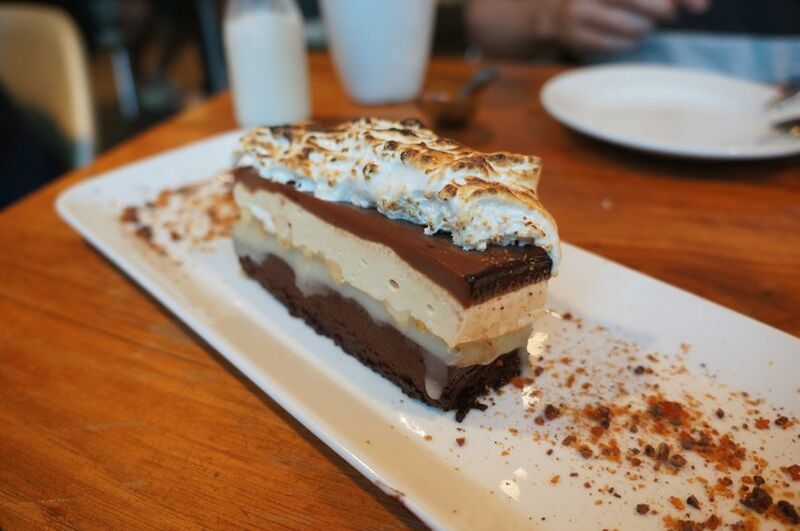 Venus Bar – layers of dark chocolate marquis, whipped ganache, caramel, salted peanut nougat & toasted banana marshmallow ($10). The menu suggests that you share this and after one bite, I knew why. It’s incredibly rich and intense so I wouldn’t try tackling this on your own. This chocolate bar definitely requires a sweet tooth! Profiteroles – with Lindt chocolate ice cream & drizzled with chocolate & caramel sauces (3 for $9 or one for $5). 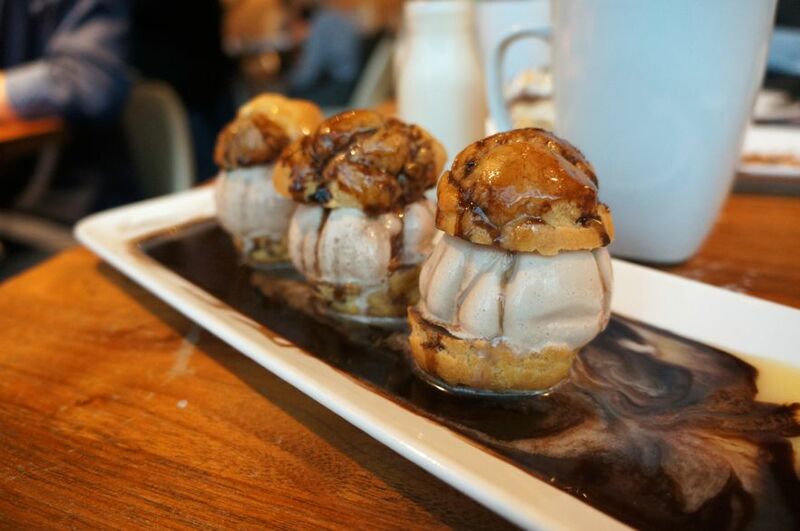 We really enjoyed these cream puffs which were filled with a decadent chocolate ice cream. It was a great way to end the meal. Like I said, Mildred’s Temple Kitchen is so much more than just pancakes. Their delicious new dinner menu is offered Thursdays to Saturdays from 6pm to 10pm. Come check it!